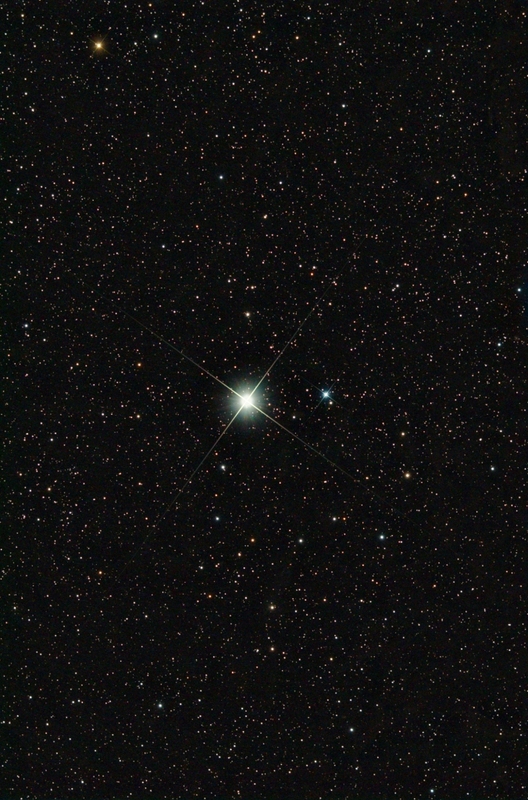 Another one from last night – this time Polaris using 19 subs at 5-minutes per sub on the M26C/Sky 90. A few faint fuzzies in the background, but annoyingly just missed Polarissima Borealis. North is up and note that we are now in portrait mode. Why is that? Well you know I am no fan of this GEM and this just makes things even worse. If I image in the South, the stupid mount is cantilevered right over and the cameras point at the sky in Landscape mode. Image to the North and the mount axis is straight up down (or almost) and the cameras now point at the sky in portrait mode. Now what the hell is the use of that? With my alt-az on a wedge if I set the camera up in Portrait (or Landscape) mode, that’s how it was set no matter where it pointed in the sky – as it should be. I dunno, variable Portrait/Landscape modes, Meridian flips, what a load of rubbish!! If you define Portrait mode as the orientation with the North-South direction parallel to the long direction of the picture (for Landscape mode read short dimension) this picture is really not in Portrait mode. North is not up but about 45 degrees to the left (about 10.30 on the clock). So you could say that the picture is in neither Portrait nor Landscape mode! I think you are too hard on the GEM mount! If you set the camera up in Landscape mode on a GEM it will be in Landscape mode wherever it is pointed in the sky (except directly on the pole where the aspect mode is undefined). There is no difference between a GEM and a fork mount in this respect. When a GEM does a meridian flip it only rotates the picture 180 degrees. The field of view and the aspect mode don´t change. And a fork mount is not exempt from flipping! If you observe with a fork mount along the meridian and go from North at low altitude up through Zenith you would normally do a meridian flip on the way. All this is of course based on the above definition of Portrait/Landscape mode. I understand your feelings about the GEM! I said North was up (which it is) I did not say it was at the 12 O’clock position – and it is nothing like 45 degrees to the left from memory. I had estimated the direction from the center of the picture to the pole to be 45 degrees to the left from up. When I measured it as accurately as I could I found 45.5 degrees +/- one or two degrees. So you might as well say that North is to the left! When you are imaging the polar region with the pole in the center the counterweight bar does not have to be up-down. It can be horizontal or in any other position. In this situation the Portrait/Landscape mode is undefined. It is interesting to note that if you want to image Polaris and have it centered in the picture the situation is more complex. Provided that the optical axis of the telescope can point to the pole when the mount is perfectly aligned (which means that there is no cone error) then Polaris can be centered in the picture with the counterweight bar (the declination axis) in only one position which varies with time. Whether the picture is in Portrait or Landscape mode depends on the orientation of the camera. Ahh – I now see (and finally understand) what you’re saying. I did centre Polaris in the frame for this image.